I opened fifty restaurants in my forty years in the business. And don’t mean fifty restaurants that were opened by somebody else but on my watch. I mean physically managing the effort and handling the service training myself. God, I loved it. I loved it so much I kept opening restaurants when I should have back at headquarters running the company. I’m often asked, “Where were you in the restaurant business?” My stock answer is, “After forty years, Almost everywhere. Almost every major city.” And to that point, here is a partial list: Boston, Hartford, New York, Philadelphia, Washington D.C., Richmond, Memphis, Atlanta, Fort Lauderdale, Cleveland, Columbus, Cincinnati, Louisville, Saint Louis, Minneapolis, Indianapolis, Madison, Milwaukee, Dallas, Phoenix, Seattle, Portland, San Francisco, Los Angeles and Orange County. Whew! I always say that opening a full service, full bar restaurant is as close to theatre as you can come without greasepaint and curtain calls. The wait staff had a script or at least an outline of same, there were twice daily rehearsals for a week and a half followed by two dress rehearsals in front of a full house; dress rehearsals bigger than any opening night could be. The theory behind slamming the kitchen and wait staff with a tsunami of customers ordering way more than paying customers would ever order was that Tuesday’s real opening for paying customers would feel like child’s play. Yes, always a Monday or Tuesday and without fanfare, a so-called soft opening. If you open a restaurant on a weekend you should be institutionalized for your protection and the protection of others. Like many of life’s lessons, you don't need a Saturday night cataclysm to learn it. Oh, then take a day off after the second dress rehearsal to take a deep breath and prep for opening night and real customers. You are ready, young misses and sirs. The formula worked 100% of the time I’m proud to say. And the so-called Friends and Family Nights, the dress rehearsals, were the key. 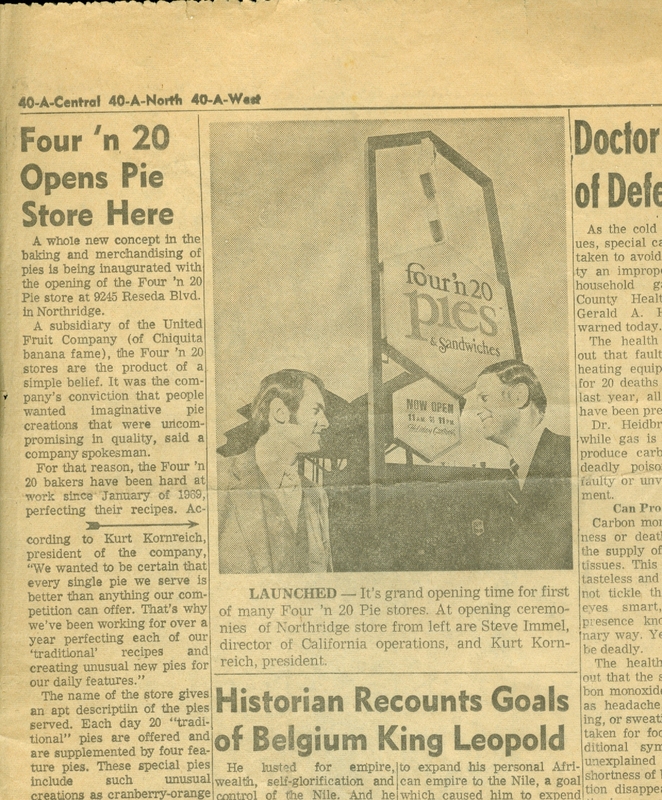 Kurt Kornreich and I at the opening of the Four n' 20 Pies in Northridge, California in 1969. Training waitstaff, I say servers, was divided into two parts; the philosophy of service in which I preached the gospel according to Steve and the mechanics of service which I first dubbed “Steps to Service” in 1969 when I opened the first Four n’20 Pies in Van Nuys, California. I don’t know how I knew that telling servers what was expected of them was a good idea. I just did. The last time I preached was at pulpit of Copa Café in Lexington, Massachusetts in 2003, a span of 34 years. Here’s the scene. Imagine you are one of 30 new servers who are seated in the dining room of the just built and furnished 250 seat Rocco’s Meat Market. The sounds of finishing touches being completed fill the air. You have been selected from 500 candidates vying for the honor of serving huge slabs of rare steak and superb wines from a Wine Spectator Award of Excellence wine list. It’s a woody emporium with leather seating red flocked wallpaper. The joint reeks of testosterone. I lean on the proprietor for a soaring introduction. She leans on me to sell the thing called service. It’s what I do. I walk to a barstool I’ve already placed in front of the adoring throng. On my way to the barstool I casually remove my suit coat and hang it on the stool. Let’s get down to business, people. I gaze around the room with a welcoming smile. “This my 51st restaurant opening, I opened my first at the turn of the last century in Dodge City, Kansas, Come to think of it, that was a steak house, too, but with more of a brothel theme. Anyway, I’m a service guy. A long time ago a mentor of mine, Don Smith was his name, described a restaurant as being like a three-legged stool, that if one of the legs doesn’t hold its weight, the stool collapses. I agree with the premise but will tell you service is the most important part of any successful restaurant experience, the most important leg. Service, how we are treated, is what we remember. In fact, I can tell you about my three or four best dining experiences, but I can’t tell you what I ate. I can tell you how I felt. I can even remember some of the dialogue. Our first $100 meal was at the Blue Horse in Minneapolis. It was 1972. Our waiter was Bill. He was about 50 with gray hair and glasses. He had a sly, almost conspiratorial style. He smiled, was engaged and made eye contact with each of us as he took our orders. I don’t recall the dishes we ordered. They were probably from the Sixties songbook, dishes like Veal Oscar and Steak Diane. I do remember that I choose a 1964 Chambertin. Bill said, “That’s a great bottle of wine, sir.” Bill was right and he had actually called me sir. I would describe the red burgundy as a supple, round wine redolent of black cherries and new Oak. The finish lasted till tomorrow. The Blue Horse closed a long ago and Bill went to the slammer for bookmaking. Sad thing. The world lost a great waiter. I believe that you can’t lose a customer if you give a damn. And, the corollary is true. If you care about them they’re yours forever. I think the desire to please your customer, to make them happy, comes from something that’s inside you. Having your customer enjoy their dining experience should give you pleasure, too. That’s why I believe that great servers are born not made. A friend of mine who’s a restauranteur says, “Anybody can be a server.” I disagree. Being a good server means that you’re smart, that you have a good memory and that you can handle pressure with a smile. And, most important, you like people. Many years ago, certainly before 1976, I heard a guy named Bob Farrell speak at the NRA convention in Chicago about keeping customers. That's 'R' as in restaurant not the other 'R.' And, by the way, there’s nothing more important to a restaurant than the repeat customer. They are gold. Bob’s the one who taught me the “can’t lose a customer if you give a damn” axiom. He had started an enormously successful Gay 90s themed ice cream parlor chain in the Pacific Northwest. It was built on in your face service. Something I brought to Vinny Testa’s in Boston in the mid-90s. Bob’s first location was in Portland, Oregon. It was a rainy Sunday when the first location opened its doors. It was so busy that you had a fifty-fifty chance of getting your burger, ever. In the middle of the chaos and the lost orders and with poor Bob scrambling from the host desk to the kitchen for the missing BLT at table 20, a little old lady stood up in the middle of the room and yelled, “I’ve been waiting for my Banana Split for an hour. I’m leaving.” She headed for the door. I told that story at every opening I did from the mid-seventies to 2003 when I left the business. I told the story to 2,000 KFC franchisees at our national convention. You can’t lose a customer if you give a damn.” I've been known to tear up when I tell it silly as it sounds. Then I'd continue. “When I opened my first Four n’ 20 Pies in Van Nuys in 1969 I distilled the essentials of serving the customer service down to what I called the Steps to Successful Service. There were nine steps for that simple concept, basically a coffee shop or diner. I don’t know why I placed put so much emphasis on service. I guess it mattered to me so that’s what I did. Here are the steps from Four n’ 20 Pies. 7. Check back to see that they’re enjoying their meals. 11. When those delicious slices are eaten, return to the table. If your guests are finished, drop the check and say “Thanks for joining us. I hope you enjoyed yourself. You can pay me whenever you’re ready. No rush.” or words to that effect. 12. When your guests have tendered their payment, cash or credit, take it now. When the money’s out it means they’re ready to go. They want to leave so get them the hell out, so you can get another party. This is capitalism at its purest. These steps are nothing more than common sense and no more than what you want as a customer. 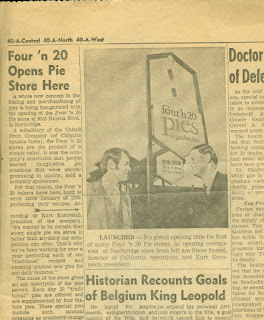 Starting with Four n’ 20 Pies in 1969 I employed Mystery Shoppers to reinforce the importance of performing all of the steps all of the time. I used Kelly Services, formerly Kelly Girls, since there were no shopper services back then. I had sold menswear at a major department store in Phoenix when I was in college. The store used shoppers and if you didn’t Sell Up and Add On you didn’t have a job. In the restaurants that I operated we weren’t quite that heavy handed, but we did let our servers know when they had come up sort. When a server did all the steps they got a $20.00 tip cash on the barrelhead. If they didn't they got an "Oops Card" with the missed steps checked off and the message, “Better Luck Next Time.” I used a mystery shopper program of some kind till I retired. There’s a certain amount of unthinking blow back to the selling parts of the Steps to Service, the contention that offering an appetizer, dessert or second glass of wine is being “pushy.” Far from it. Offering the appropriate, the obvious, the things that will make the meal more complete are providing service, better service, service that will be remembered when it’s time to tip. The customer isn’t counting your visits to the table per se but has a general sense of how much service you’ve provided. And, and the flip side, if you did not offer me that second glass of Ramirez de la Piscina Reserva when there was an inch left in my glass I will remember it. When you’re a server you are renting real estate in the proprietor’s restaurant. It’s her mission and yours to optimize the sales in your station and her restaurant. Here’s a simplified example that shows the opportunity a server has for optimizing the proceeds from his or her station. For this example, I’m using a five-table station and I’m assuming three turns of the tables. Each server in this comparison will serve 50 customers. That’s where the similarities end. Restaurant openings are exhilarating and exhausting at the same time. The two a day training sessions are scheduled from 10am to 2pm and 6pm to 10pm to accommodate new hires who have other jobs or go to school. You hope that about half your new staff will attend each session though it rarely happens exactly that way. Two separate sessions spread out like that make for a grueling day for management staff and trainers. I worked 80 to 100 hours for two or three weeks in all of my openings. And if you include the late nights at the Donovan’s Saloon it was approximately 150 hours. When Lenny Levenson, Mark Olivari and I opened the very first Pizzeria Uno franchise in San Francisco in 1980 I learned that exercise, a shower and a change of clothes was better than a nap between training sessions. I’d take an hour run in the Presidio, do some push-ups, shower, put on fresh duds and be good as new. Mark had been a star linebacker at Tulane and was the last cut of the Pittsburgh Steelers. He was 28. His playing weight was 225 and he ran a 4.5 forty. I was 40, couldn’t make my high school football team and ran a forty in about a day. Yet he and I would run over to Chrissy Field and do matched sprints. He killed me. But, one day we went for a 12 miler through the Presidio, across the Golden Gate Bridge and back and I killed him. From the Marin side we looked back at The City shimmering in the electric November sunshine. It was one the best runs of my life. On November 27, 2004 Mark Olivari lost his appeal of a conspiracy charge and was sentenced to 2-1/2 half years in prison and ordered to pay $192,000 in restitution. Federal prosecutors say that he stole cargo passing through customs and sold it at a profit of tens of thousands of dollars. He tried to reach me by phone a few years back. I didn’t call back. I wish had. I really liked the guy. It’s the camaraderie, the sense of team, that propels you through the grind of a restaurant opening but which often leads to extra-curricular activities that have consequences. Those amorous episodes are usually among staff but can reach in all directions. The wife of the owner of the San Francisco Pizzeria Uno, went after Mark Olivari like a dog to prime beef. There was a feeding frenzy over the guy. She told Mark that she hated her husband and cheating on him was payback. He deserved it. Even if he never knew about the dalliance, she would and that was enough. She picked up Mark at the Balboa Café and they escaped to Sausalito for a nightcap or something stronger. It’s no secret that restaurant people like to party when the shift ends. And that’s even more true during an opening when the stakes are high and you’re working 80-hour weeks. Unlike my idol Anthony Bourdain I never saw drug use, but I learned that you’re never too beat for libations at your chosen watering hole. In San Francisco it was The Chestnut. In Atlanta it was The Fridays across the way. In Columbus it was Buckeye Charlie's next door. In DC it was Clyde’s with Michael Burke from Lawrence, Massachusetts behind the bar. “Another Molsons, Steve?” he’d ask. 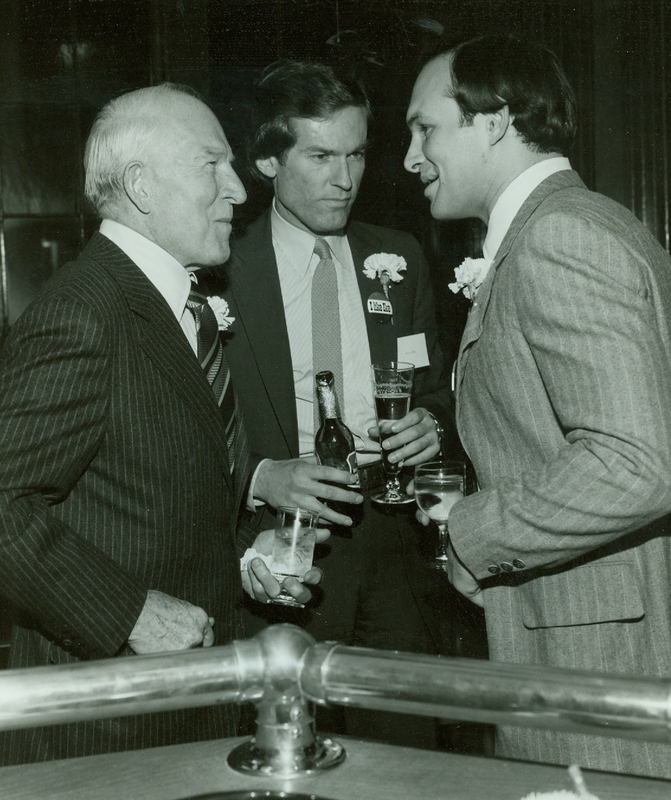 He always said Molsons not Molson. The answer was invariably, “Yes” until I switched to Saint Pauli Girl. One time I forget to pay Michael and called him from New York the next day to offer my apologies and give him my credit card number. I over tipped even more than I usually over tip to make up for my bleary oversight. But by 1984 when I opened restaurants for seven months my relationship with my senior partner and boss had reached its nadir. I’d reached the end of the line. The ordeal had taken a toll in a myriad of ways. In 1985 when he brought in a new president I finally said, “Enough” and began three years of hard-earned semi-retirement and a new, better and healthier life. Now you have both Fred and I totally confused as to which of your recent "life" blogs is our favorite. The Service Guy is definitely near the top. Quite the ride is right! Interesting to read that you miss the openings and business in general, but not surprising. A friend of ours, who was a former ballet dancer in Santa Fe, is in our books as the most amazing waitperson ever. She had an approach that was truly extraordinary. It does seem to be true that one remembers the wait person more than the meal, which means that training and a person's love of people is crucial to the success of the business. Thank you for continuing your blog journey. Once again, you leave us thirsty and hungry for more. You have to love it to do it. You are so right, Jana.